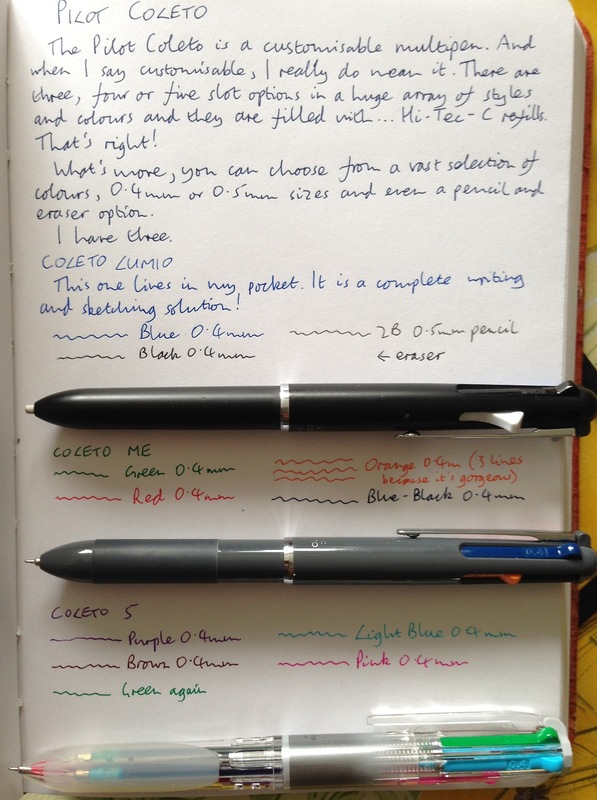 Pilot Coleto multipen review – Pens! Paper! Pencils! The Pilot Coleto is a multipen like no other. and in three different sizes (0.3mm, 0.4mm and 0.5mm). There are refillable pencil and eraser units. There are four different body styles (standard, Me, Lumio and Sweet) at a range of prices, each in a large range of colours. You can buy barrels that hold two, three, four or five refills. I could well have missed out some options but to give you an idea of how versatile this pen is, there are 4,669,920 different ways of making up a four-way barrel just from ink, pencil and eraser options alone. All this is all very well but irrelevant if the refills themselves are rubbish. But the refills are Hi-Tec-Cs! How good is that? Amazingly good, that’s how good. So this pen can be whatever you want it to be. I have three, one for my pocket which is set up for note taking, pen sketching and pencil sketching and two in my pen case with a whole range of colours for every occasion.